cooking, food, Lasagna, Mennonite Voluntary Service, On Troublesome Creek, Recipes, Whatever Happened to Dinner? Do you remember the first time you ever ate lasagna? Likely not if you are under the age of 50. It is as common as spaghetti, macaroni and cheese. Pretty much. I never tasted lasagna until I was 19, working for one year in the Mennonite Voluntary Service program near Hazard, Kentucky. We had a chief cook—the “unit hostess.” Judi Brenneman was only a couple years older than me but already she was a splended cook. She expanded my taste repertoire considerably from what I experienced growing up with an ordinary Mennonite mother cook who usually served meat, potatoes (or other starch), a vegetable, and sometimes salad. Not much in the way of casseroles or foods from other countries. But when I suddenly found myself at a table with six adults with food prepared by someone who wasn’t my mother … well, I ate it. And of course it was delicious and I learned to eat and like so many foods that year that I put on 15 pounds—the freshman 15, even though I wasn’t yet in college. I wrote about all this in my first book, On Troublesome Creek, a memoir of sorts. Now lasagna is one of my go-to staples. I frequently offer a dish of lasagna when taking food to a family where someone’s had surgery or a new baby or just moved in. 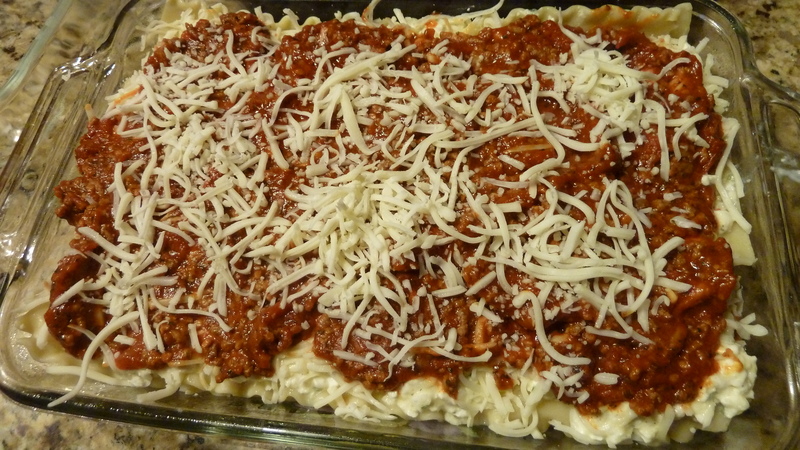 When my children were still home and I had to travel on business, I usually made sure the freezer was stocked with a pan of lasagna that they could just unthaw and bake. But that was the trick: the unthawing. 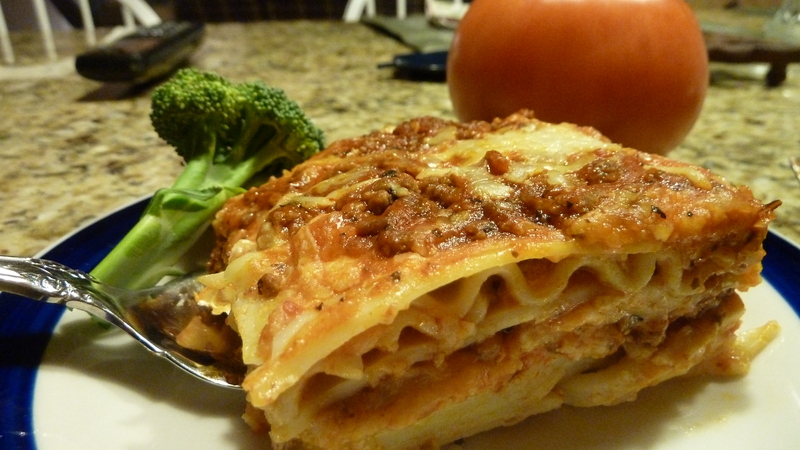 You don’t unthaw a frozen pan of lasagna in a couple of hours: it usually takes all day. I also sometimes take a dish of it when I visit my kids—they never complain and now make it themselves. Brown meat slowly and spoon off excess fat. Add next 5 ingredients. Simmer uncovered 30 minutes, stirring occasionally. Meanwhile, cook noodles in a large amount of boiling salted water until tender; drain and rinse. While sauce and noodles are cooking, beat the eggs, then mix the remaining ingredients together with the eggs, except for the mozzarella. 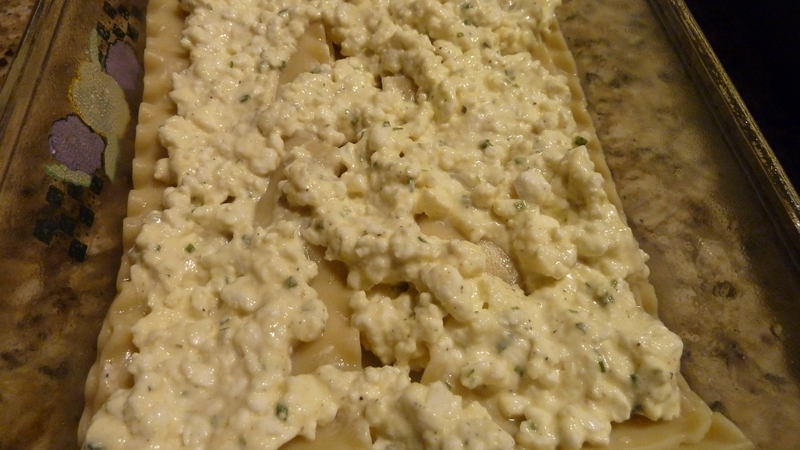 Lay two layers of noodles in a greased 9×13-inch pan. 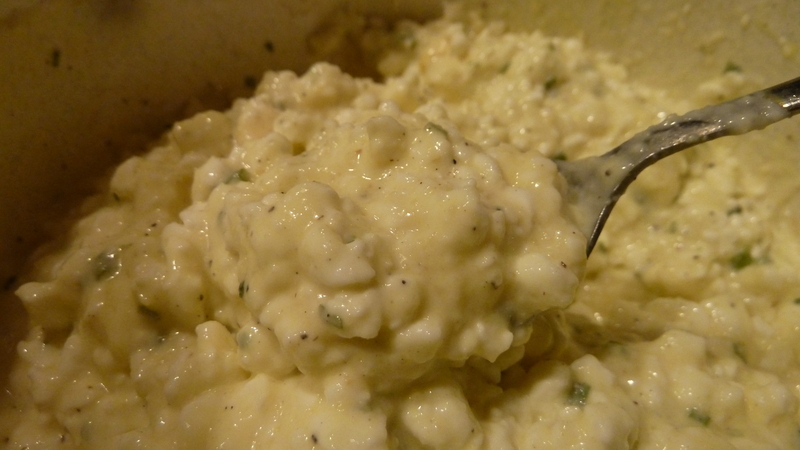 Spread with half the cottage cheese mixture. Add half the mozzarella and half the meat sauce. 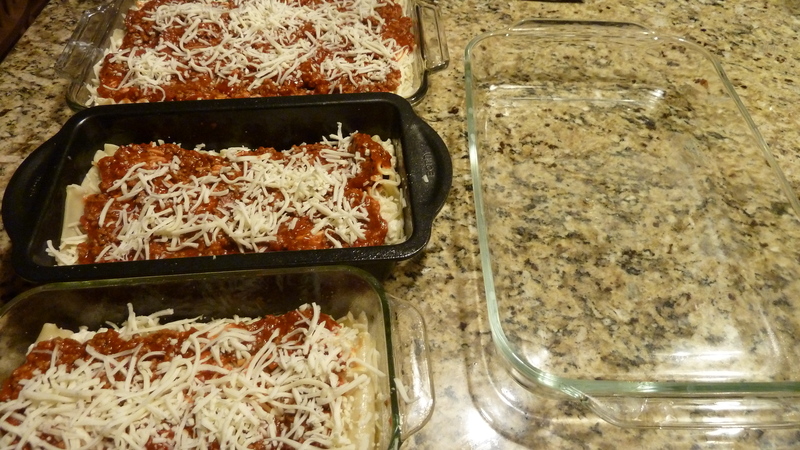 Note: If you use a 9 x 13 inch pan, you get one dish of lasagna, and likely have about 5-6 noodles left over. I hate wasting them. 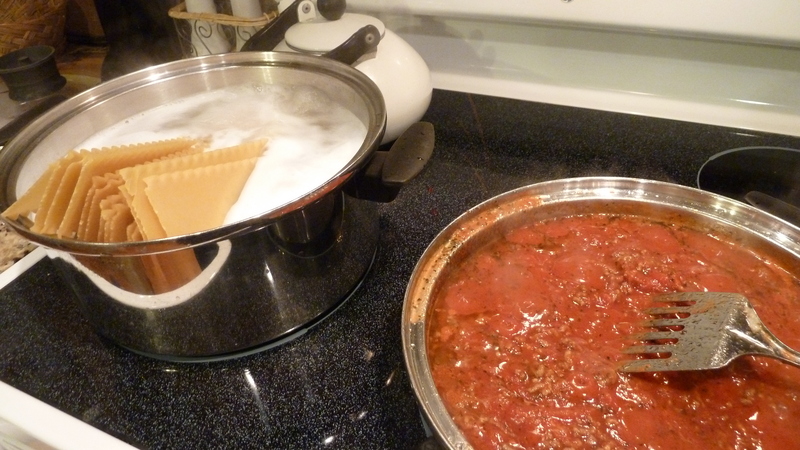 So usually instead, I use extra mozzarella and make plenty of meat sauce and just spread the cottage cheese mixture out further to make at least two, maybe 3 pans of lasagna. Bake immediately at 375°F / 190° C for 30 minutes. Or refrigerate or freeze before baking, in which case you’ll need at least 45 minutes to bake. Cover with foil for half the baking time to save the noodles from getting dried out. 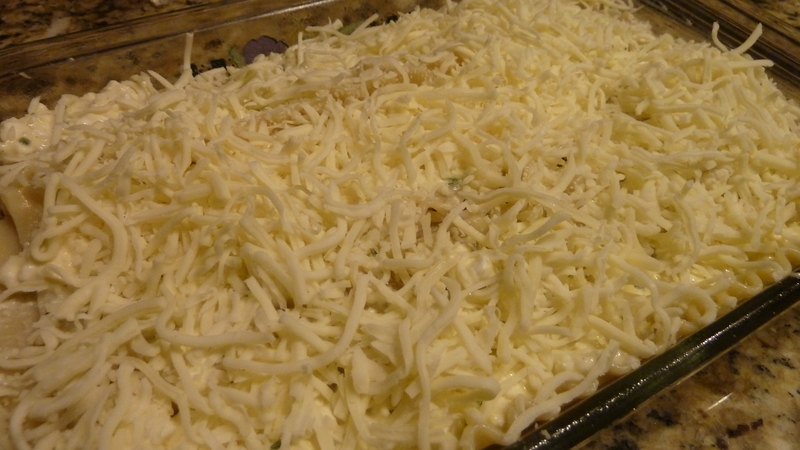 (If you freeze the lasagna, it will take about a day to thaw in the refrigerator.) Let baked lasagna stand 10 minutes before cutting. What’s your favorite dish to share with others? Or something your kids request? Huh, I’ve got to tell Judi. Maybe she’ll make it again. Maybe she’ll invite us over. Great idea!! Let’s do it! By all means, see if you can finagle an invitation out of it … didn’t know that was your community exactly. Cool! Thanks! Enjoyed your VS meal memory sharing. My first lasagna meal was eaten with MCC friends in Kentucky. Liked it so much that I decided to prepare it for our VS unit family. Is that the truth?? I had no idea lasagna was new for you too at the time. It is/was a great recipe. Love this addition! Thanks, Judi, and thanks, Shirley for tipping off Judi. Here’s another piece of information, or maybe a confession. I’ve recently discovered the crock pot version of lasagna (p125 of Fix-It and Forget-It Cookbook). Very good!! It has my husband’s stamp of approval, too. Well well well. I’m so happy! and sliced. I have never come across any one else that uses the HB eggs or any recipe for such. My grandmas would never have made lasagna, so this is something my mother seems to just use. when seeing eggs on the ingredients did not think as to stirring it into the cheese, rather as HB eggs which we ate quite a few of, pickled and otherwise. I make her recipe sometimes with real meat, sometimes with vegetarian sausage depending on the consumers. I also use a recipe from the Laurel’s Kitchen cookbook that uses spinach and sunflower seeds. One of the things I do with my excess zucchini, eggplant, peppers and onions is to chop them all up, saute with olive oil, garlic and some soy sauce and pack into 2 cup freezer containers. Thawed out these add nicely to layers in lasagna or to marinara sauce throughout the year. The soy sauce adds a meaty flavor to the mix. My most requested dish is probably homemade eggs rolls tied with homemade pizza.